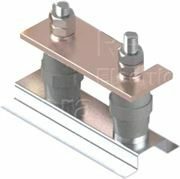 Earth Bars: Manufactured from hard drawn high conductivity copper, giving compliance to IEC 62305, Our Earth Bars provide an effective and convenient common earthing point. Off the shelf options range from small bars consisting of 4x M10 terminating studs through to 20. The option of single or double disconnecting studs is available on Earth Bars above 6-way. This is to aid when testing and carrying out maintenance on the system.